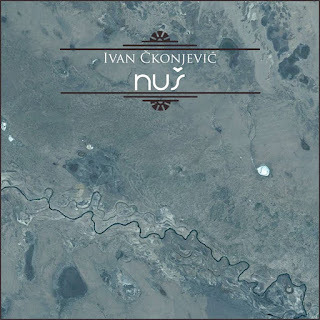 Ivan Čkonjević: Sound Colour Vibration - Review: Album "Nuš"
Sound Colour Vibration - Review: Album "Nuš"
This is Ivan’s sixth solo album and third on NoEcho, but it is the first time I have experienced his nostalgic, muted breathing on an electric guitar. It is done without dubs, solid tracks all the way through. As I listen to Ivan weep on opening piece “EXP. Nus” I cannot help but feel an overwhelming sense of loss. The track is, primarily about the night, but in the sense of how calm it can be, meaning all troubles are gone and there is nothing left to worry about. But it gives off a completely different feel to me. Yes, peace, yes tranquility, but a sort of emptiness in that tranquility, which is why I mention the feeling of losing something, maybe to the night. It could be a much needed loss, a positive loss. All the same, it creates such a tender, gentle emotion inside of me that it could easily move me to tears in the right setting. The fact that Ivan is doing this all solely with a guitar hits upon a very strong point for me. Guitar playing doesn’t need to be blazing riffs or majestic ripping’s, in fact, I prefer the gentle care that Ivan gives to each one of his notes. Each bend, each movement, each sway on the volume pedal and reverb is done almost as if he is taking care of his children. This sensibility to detail on each note is none other than haunting, hypnotic and deeply, deeply unconscious. It is as if he has entered into the abyss of night, handed himself over, handed over loss, torment, sadness, happiness and simply is. After all, isn’t that the best feeling around? To just be? The second track, which is about the effect his niece has on his mother and sister is a soft orchestra blowing in frozen winds. It is a nice feeling, a sense of numbness and tranquility as if returning to the womb where we all come from. His plucks resonate like heaven’s harps and his again careful attention to each sound continually morphs into instruments he is not playing. The fact that Ivan can create these very strong emotions with one instrument and pedals is a totem for all atmospheric guitar players in general. It makes me realize the ridiculous amount of noise we have in our lives, the lack of quietness, the lack of softness in a city. It is a fresh breath of crystallized air that vaporizes inside of one’s lungs giving back a sort of enlightenment. An absolutely gorgeous piece that sways like a newborn in mother’s caring hands. The last piece, probably the darkest one, begins with unearthly sounds vibrating from volume pedal to soft shimmer (possibly chorus pedal?) and then back to soft crunches of Ivan’s foot against the pedals. It is strange to be able to hear how drastic each note changes the flow of the song. It is of course haunting, droning, almost mocking, but again, gentle in detail. I have never been able to pay attention to a track and focus on one note, this time; Ivan makes it easy, apparent and necessary. It really is a magnificent piece of work, one that I am very, very happy to review and indulge in. Each note is its own, intricate, haunted world welding itself on top of each other. Isolation rings true throughout the track and it does not bring sadness but despair and doom. It creates the sense that things aren’t quite right, that things are slowly falling apart and flying away, possibly the opposite of what the first track creates. Here, Ivan does not want to lose his connection, here, loss isn’t necessarily a good thing. Here is a world where one does not belong and his very skin crawls with confusion and loneliness. The album is incredible. It isn’t an album to be taken lightly. It is one to be played and really listened to. I salute Ivan for his fervent, gorgeous playing on his guitar. To read it on SCV page go here.